Betty Boop is a tribute to bad girls everywhere. Okay maybe not bad girls but definitely girls with attitude and lots of moxie! She's got style and defintely gets into mischief. Her classic cartoons are touted as some of the best ever made and she's featured in many Top 10 lists of the best cartoons. But you never even have to see a single Betty Boop cartoon to love the style of perhaps the first original, modern day fashionista. 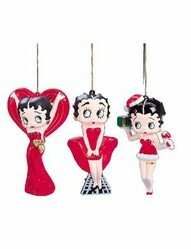 Kurt Adler christmas ornaments capture the Betty Boop hijinx perfectly. Perhaps my favorite Adler ornament is Betty Boop dressed up as Santa flailing in front of the fireplaces - legs and arms gracefully displayed. While the ornament is definitely all about Betty, Adler expertly fills in the background with a fireplace mantle decorated in a garland and Christmas stockings featuring a mantle clock. 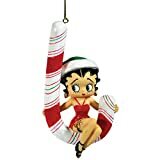 At under $10 this is a budgt-friendly affordable Betty Boop ornament to include in your own Christmas decorations or to give to a friend. Speaking of giving gifts to a friend. 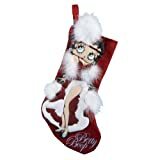 If you've got one who loves to hit Las Vegas or some of the other casinos scattered around the country give her a Betty Boop cards and dice Christmas ornament. This is so much more fun than most of the other gambling or casino ornaments that I've seen. And yes, if you look to the right you'll also see that I got carried away and added a Kurt Adler Betty Boop Christmas stocking to the ornaments mix. Why? Because I just couldn't resist it. It's a very grown up Christmas stocking. Perhaps filled with goodies best displayed in the bedroom. Okay this is a very PG webpage, So you'll just have to use your adult imagination! Check out the real Betty Boop in the 1933 Snow White cartoon. Unbelievably it was animated by just one person - Ronald Crandall. With background music by the legendary musician Cab Calloway, it is consider by many experts to be one of the best cartoons ever made. Filled with humor, site gags, and clever drawing, it is an example of the best from the Fleischer Studios. Unfortunately you never get to see Cab Calloway and his orchestra in this Betty Boop cartoon, but you can enjoy several of their best known songs. It's a very loose but entertaining version of the Snow White fairy tale. 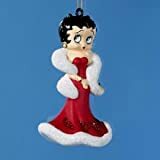 With her lipstick red dress and porcelain skin, Betty Boop ornaments will look great on any Christmas tree or tucked into Christmas garlands. Betty has a life. She gambles, rides motorcycles, visits New York City and parties the night away. She hangs out on candy cane swings. Her red dresses would make Mae West swoon. We all remember Mae West right? 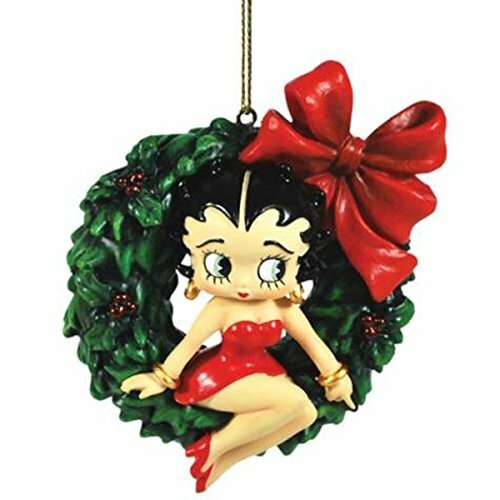 So add a Betty Boop ornament to your Christmas tree and show the world some sass! Betty Boop is all decked out for Christmas in a bright red dress and heels. Her outfit matches the bright red bow on the Christmas wreath perfectly. As always Betty's expression is perfect. She's wearing gold hoop earrings and bangle bracelets. The dark green Christmas wreath frames her delicate complexion, dark hair and red dress. This exquisitely detailed round Christmas ornament measures 3-1/4 inch across. Big and bright enough to be noticed, small enough to fit most places on trees of all sizes. A Betty Boop collector will love it.